Orchids comprise the largest family of plants on earth. Nearly one in 8 of the known plant species in the world is an orchid. 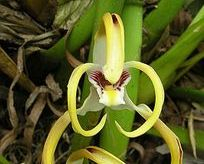 Over 30,000 species of orchids are recognized with new ones being discovered each year. Most orchids come from the tropical climates of Central and South America, Africa and Asia, and North America can claim 150 native species. At one time orchid hunters traveled the globe to bring back these exotic plants for wealthy British collectors. 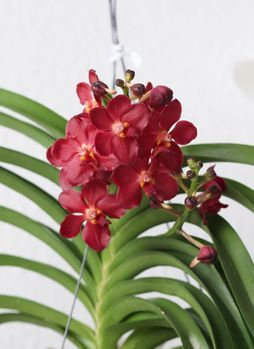 Today, many home gardeners enjoy the hobby of raising and growing orchids. Light: east or shaded western exposure. Temperature: Nights of 60-65F and days of 70-85F. Moisture: Water thoroughly and drain when nearly dry, about every 5 to 7 days. Maintain humidity at 60-70%. Nutrition: Fertilize with 20-10-10 in spring & summer, 10-30-20 in fall & winter at 1/2 strength biweekly. Potting: Every 2 years in spring or after flowering in a well drained bark mix. Tips: 55F at night in Sept. or Oct. will trigger spike initiation. Breaking the spike below the first flower before Mother's Day may induce a secondary spike that will bloom 3 months later. A very diverse tribe with a wide range of cultural needs. 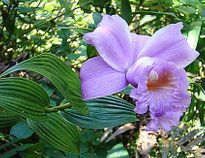 The most popular cane type blooms 1-2 times a year with many flowers in purple, white, green or yellow. Light: West or south window with light shade in summer. Temperature: Nights of 60-65F and days of 75-90F. Moisture: Water thoroughly then allow to dry, often if plant is in a small pot. Nutrition: Fertilize with 20-10-20 on every watering in summer. Use 10-30-20 to encourage flowering and reduce to almost none when plant is resting. Potting: Re-pot every 2 years in a medium bark mix and the next size pot. Tips: When purchasing a plant be sure it is not over potted and that it is in the proper media. 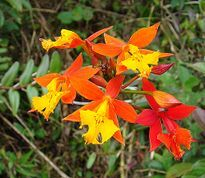 This is a terrestrial type of orchid with a rapid growth rate. Light: High light during spring and summer. Shade during hot months, no shade during fall and winter. Temperature: 75-80F daytime temperatures, 55-60F night temperatures. Late summer & fall drop night temps to 55F. Moisture: Water frequently during spring & summer, reduce watering in winter. Nutrition: Use 30-10-10 from fall to summer with every watering. Switch to 10-30-20 in May, using clear water every 2nd or 3rd watering. Potting: Requires finer bark mix than other types. 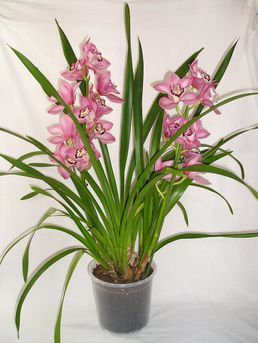 Tips: Good air movement is important to Cymbidiums, especially while actively growing. It also helps to prevent flower spotting. This is an epiphytic orchid which requires high light. Light: Inside, bright southern location. Outside full to part sun. Temperature: Daytime temperature 65-95F, nighttime temperature 60-65F. Moisture: Spring & summer water frequently when outdoors. Mist frequently. Nutrition: Feed a balanced 18-18-18 fertilizer during spring & summer. If used at every watering cut the rate by 1/2. Potting: Chunks of coarse bark or tree fern mixed with general orchid mix. Plant in redwood hanging basket or slotted clay pot. Tips: If Vandas are grown in the home, it is recommended to summer them outdoors where they will receive nearly full sunlight. Known as the Pansy Orchid due to the many long lasting, large flat pansy shaped flowers. Light: East window or shaded west or south. 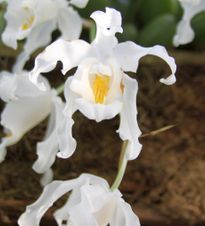 Temperature: Nights of 50-55F and days not over 80F or flowering may be inhibited. Moisture: Water every 5-7 days. Leaves will grow like an accordion if plant does not receive enough water. 70% humidity is ideal. Nutrition: 20-10-20 at 1/2 strength two times each month, switching to 10-30-20 in spring. Potting: Yearly, after blooming in a small pot with seedling bark mix. 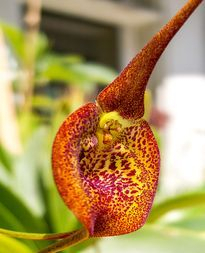 Lady Slipper Orchid - Easy to grow in the home. Small plants with relatively large flowers that bloom up to 3 months, ranging in color from green, yellow, white to very dark burgandy. Light: East is ideal or 2-4 fluorescent lights close to the plant. Temperature: Depends on the foliage type: Warm growing mottled-leaf type - nights of 60-65F and days of 75-85F. Cool growing green leaf type: Nights of 50-60F and days of 70-80F. Moisture: Keep media constantly moist, water every 5-9 days, 40-50% humidity is ideal. Nutrition: 20-10-20 every other watering at 1/2 strength, less in winter. Potting: Repot yearly with a prepacked paphiopedilum mix. Tips: Allow plants to produce many growths before dividing for better blooming. 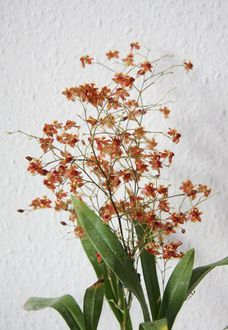 Dancing Doll Orchid - A group of genera that may be hybridized to create unique color, shape, or form and thrive under more moderate conditions. Light: East, south or west window with protection from hot afternoon sun. Temperature: Nights of 50-60F and days of 70-85F. Moisture: Varies with plant but thick, fleshy roots and leaves require less than thin roots and leaves. Water every 2 to 10 days, thoroughly when media is somewhat dry. Humidity of 30 to 60%. Potting: Re-pot every 2 years when new growth is evident at base of plant usually in Spring. Tips: Some types have a winter rest period after blooming, so keep dryer until new roots initiate. 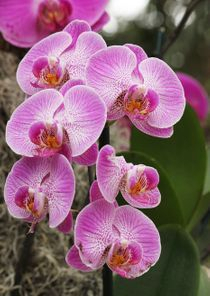 Queen of Orchids - A wide range of colors, shapes and sizes, many with fragrance. Flowers last 4-8 weeks, blooming 1-3 times each year. Light: East, west or south window with protection from hot afternoon sun. Temperature: Nights of 55-60F and days of 70-85F with a tolerance of 95F. Moisture: Water thoroughly, drain, and again when pot is completely dry about every 7-10 days depending on humidity which should be 50 - 80%. Nutrition: Fertilize with a 20-10-20 during active growth every watering and 10-30-20 when plants are approaching bloom. Potting: Every 2 years when plant is producing new roots and growth, usually in spring. Tips: If a plant does not bloom move to a brighter location and be sure not to extend natural day length with artificial lights. 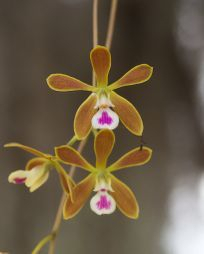 These orchids, originally from high altitude climates, flourish where cool temperatures prevail year round. They are known for their striking sprays of flowers. Light: Bright light in eastern or shaded south window. Temperature: Day temperatures below 75-80F. Nighttime temperatures of 55-58F. Moisture: Water just before media drys out every 2-7 days. Nutrition: Use 30-10-10 twice a month during growing season, 20-20-20 if using bark media. In winter use only once a month. Apply 10-30-20 when plants approach bloom time. Potting: Re-pot in spring or autumn when new growth appears to be half mature. Tips: Odontoglossums are highly sensitive to poor quality water, which can cause poor roots and leaf tip burn. Orchid plants are actually quite hardy. It's the flowers that are delicate and care should be taken not to touch the blooms or get them wet. 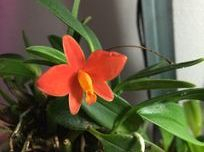 The greatest challenge for most orchid growers is getting them to bloom. Many will flower only after receiving a 4 to 6 week period of night temperatures 10 to 15 F degrees below the daytime temperatures. This is why many orchids are winter bloomers. 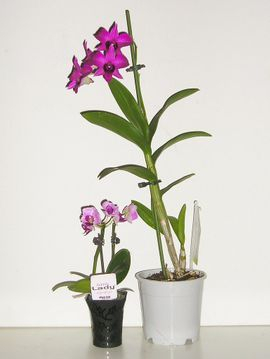 When successful, however, orchids will reward their growers with 6 to 8 weeks of blooms. The following chart lists the nighttime temperatures and light requirements for several types of orchids. Temperature conditions are crucial for getting your orchid to bloom. Plants which do not experience a fluctuation between daytime and nighttime temperatures will produce only foliage...not flowers. Orchids fall into 3 temperature categories: warm, intermediate or cool. Warm: Day, 75-85F, Night, 65-75F. Intermediate: Day, 65-75F, Night, 55-65F. Most orchids are comfortable in the intermediate temperature range. Generally speaking, orchids prefer bright indirect light, especially when in bloom. 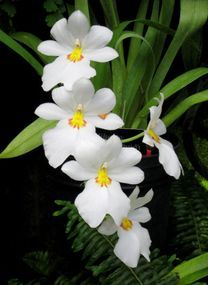 Orchids have much more tolerance to too much light as opposed to too little light. The best method to determine if you have enough light is to use a light meter, available at most garden centers. Artificial lights can be used to supplement your natural light conditions. Remember that day length affects blooming and plants should be under the lights less time in winter and more in summer. Determining humidity levels can be very confusing. 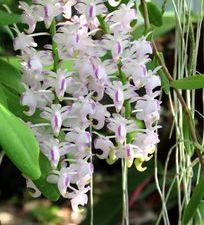 Orchids, like most plants, prefer 40-70% humidity. Our homes, however, can have only 20-30% humidity, especially in winter when our heaters are on. Plants rarely complain because of too much humidity. Misting your plant only provides temporary relief lasting a couple of hours. If possible use a room humidifier or group your plants together and place them on trays filled with pebbles and water. A terrarium, with a top that opens, can also be used. Air movement in the home can be achieved by periodic opening of doors and windows. Proper ventilation is more crucial when growing your orchids in a greenhouse situation. Good air movement provides carbon dioxide for your plants and helps to evaporate excess moisture which may cause disease issues. Don't place your orchid in the direct line of drafts as this can cause rapid drying of leaves, browning of leaf tips and shrinking of stems. Over watering is the fastest way to kill an orchid. 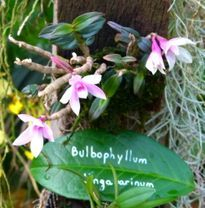 Most orchids are epiphytic, growing in trees in rainforest situations. Here the plants get soaked with rain but the water drains quickly from the root system. Terrestrial orchids, growing on the ground require more moisture than their tree dwelling kin. To determine if your orchid needs water either feel the media with your finger or pick up the pot. The pot when wet will be much heavier than when dry. Soak your orchid in a sink with tepid water. Orchids use fertilizer very efficiently. During the growing season fertilize every 3rd or 4th watering. When growth slows in fall and winter fertilize only once a month. Dilute your fertilizer to half strength. It is better to fertilize more frequently with a diluted fertilizer than to supply it all at once. Fertilizer injury will show as a burning of the leaves and roots. Repotting your orchid should be done when it is not in bloom. 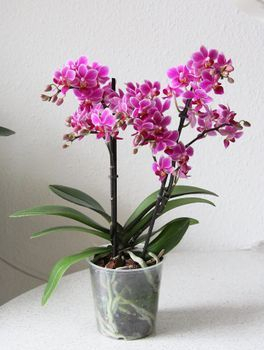 Remember that orchids prefer to be slightly pot bound so do not repot into a container which is too large. To repot, gently remove your orchid from the pot, remove all old bark media, trim off any dead roots with a sterile knife. Then repot using a medium fir bark mixture. Terrestrial orchids will need a fine bark mixture. If your orchid came planted in spaghnum moss, remove the moss and replant into a fir bark mixture. 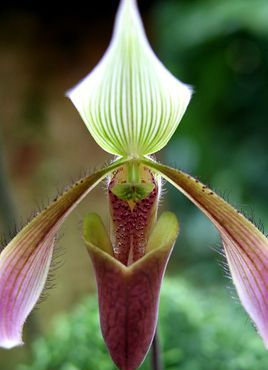 Orchids may be propagated by division. 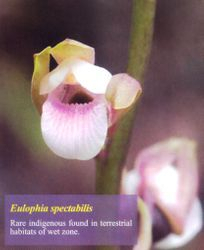 The swollen base of sympodial orchids are called pseudobulbs. These may be separated and planted into smaller containers. 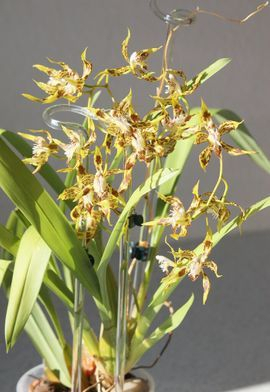 Monopodial orchids form keikis (pronounced kee-kees) which are baby plants produced on offshoots or stems. Once these have grown roots they can be removed and planted. 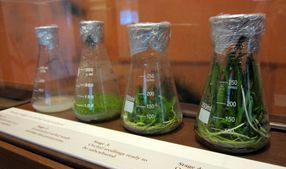 Orchids can also be grown from seed or tissue-culture. 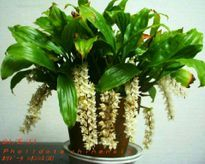 This can be difficult and is usually only done by professional orchid growers. Download a free guide to growing orchids.